The property resides on a small exclusive development of similar properties within Laughton and is well placed for a good range of local amenities including shops and schools. Worksop, Sheffield and Rotherham are all within easy traveling distance and the motorway network is within easy commuting reach. External door giving access to the entrance vestibule having laminate covering to the floor and central heating radiator. Giving access to the downstairs WC and hallway. The spacious hallway has fitted carpet to the floor, central heating radiator and stairs rise to the first floor landing. The superb lounge has dual aspect with twin front facing uPVC double glazed Windows and French uPVC double glazed doors giving access to the rear garden. There is fitted carpet to the floor and central heating radiator. There is stylish paper to the feature wall and the focal point of the room is the feature fireplace with back panel and hearth inset with chrome coal effect gas fire. The spacious dining room has laminate covering to the floor, central heating radiator and there is ample space for family sized dining table and chairs. Having a range of wall, drawer and base cabinets, complementing work surfaces incorporating a four ring ceramic hob with extractor hood above and inbuilt electric oven. Set beneath the rear facing uPVC double glazed window is a stainless steel sink and drainer, there is ceramic tiling to the splashbacks and floor, central heating radiator and uPVC door giving access to the rear garden. Benefiting from base cabinets and black counter top inset with stainless steel circular sink and drainer with mixer fitting. There is plumbing for automatic washing machine and space for tumble drier. Ceramic tiling to the floor, central heating radiator and uPVC double glazed window. With a white wash hand basin and low flush WC, central heating radiator, ceramic tiling to half height and to the floor. Extractor fan and opaque uPVC double glazed window. Stairs with solid oak handrail and spindles rise to the first floor landing, further stairs rise to the second floor. The spacious master suite has front and rear dual aspect with twin uPVC double glazed Windows, two central heating radiators and fitted carpet to the floor. There are a substantial range of Sharps fitted bedroom furniture and wardrobes. Having a white suite with mixer shower fitting, pedestal wash hand basin and low flush WC. There is ceramic tiling to half height and to the floor, central heating radiator and opaque uPVC double glazed window. The spacious double bedroom has laminate covering to the floor, central heating radiator and uPVC double glazed window. With an enclosed shower cubicle, white pedestal wash hand basin and low flush WC. Ceramic tiling to the splashbacks and floor. Central heating radiator and extractor fan. Having a white suite comprising bath, separate enclosed shower cubicle, pedestal wash hand basin and low flush WC. The walls are tiled to half height and there is ceramic tiling to the floor. Opaque uPVC double glazed window and central heating radiator. With a uPVC double glazed window, central heating radiator and fitted carpet to the floor. Having a velux skylight and central heating radiator. With a uPVC double glazed dorms window, central heating radiator and fitted carpet to the floor. The double bedroom has a uPVC double glazed dorms window, central heating radiator and fitted carpet to the floor. With an enclosed shower cubicle, white wash hand basin and low flush WC. Central heating radiator and extractor fan. To the front of the property is a double block paved driveway leading to the double attached garage and front entrance. There are two decorative metal side gates giving access to the rear garden. The enclosed rear garden is lawned and a patio area provides space for outside dining. 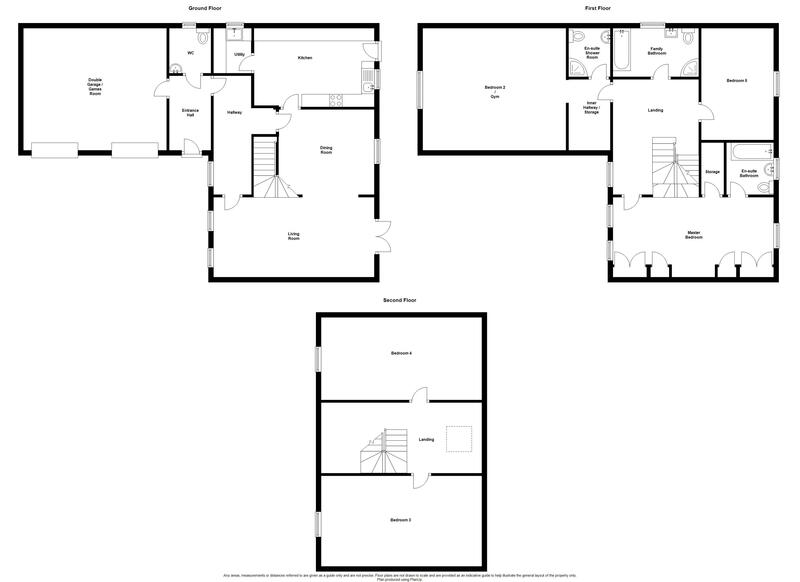 Currently used as a games room by the current vendor, having power and light and integral door to the hallway.